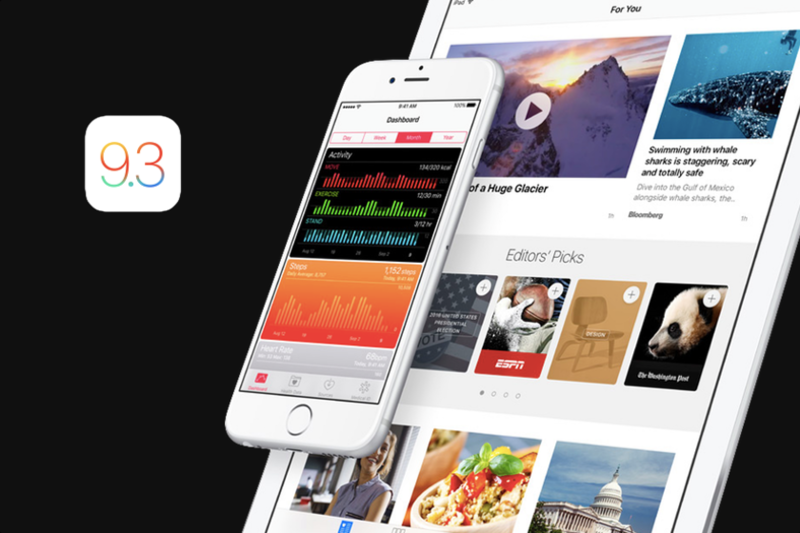 Apple just announced new features from their incoming iOS 9.3 release, in a way I haven’t seen before. And I think some of these are worth talking about. Users have something like this already for Mac via f.lux, an app that filters blue light by daily intervals to help sleep at night - it’s great to see it come to iOS. It’s also great that it’s automatic and doesn’t require manual input if you change your timezone. Although one thing about f.lux that I really like is the ability to have the filter switched off for specific apps e.g. for QuickTime or VLC so I can watch a movie more clearly. It isn’t clear if Apple will provide that kind of granularity, but I think there are some experiences that can worsen with a lack of colour accuracy. I don’t know if this is a novel idea, since I don’t have a Touch ID-enabled device and don’t follow app updates for other note-taking apps frequently. I’d imagine an app like Day One already has this and I just don’t know. But it’s a genius, “well, duh” idea nonetheless. I think that there’s potential for other types of apps, or sections within apps e.g. private photo albums, to implement something like this as well. I also think that Apple was waiting for the right time to (potentially) increase the scope of Touch ID’s use. Touch ID improved dramatically with the 6S iPhones, reducing the response time to an instant. From what I’ve heard, Touch ID has always been responsive, and industry leading in that regard. But if they’d implemented this when Touch ID first came out, there could’ve been a lot of minutes of cumulative time wasted simply waiting for fingerprints to register. …which brings me to Health improvements. I personally have the Health app stashed in my “⛔️” (unused) folder, as I don’t use any third party health apps or devices other than Nike+ Running. But I can totally see how someone that regularly has a use for it, such as Apple Watch users, will be benefited by these improvements, such as the app now displaying move, exercise, and stand data from the Watch. I think they’re openly embracing third party apps as well, giving them sections under relevant data types for increased discoverability. There seems to be a more unified vision for health and fitness than other lifestyle aspects of the iOS/watchOS experience, bar photography. Hence fitness tracking being a tentpole feature of the Watch when it was first introduced. I’m always interested in what Apple does in education. There’s so much potential, but I feel like up to this point that a) they do a lot, but not enough, and b) there are a lot of conflicting objectives, such as profit maximisation vs. affordability (which I think is the primary factor behind Chromebook’s near monopolisation of the market). These new steps seem to bridge that gap with new education tools coming to iOS through 9.3, as well as the Mac. Actually “tools” is putting it lightly - they’ve built entire frameworks for education. I think they’re feeling the pressure from Google, and Apple’s always at its best under pressure. Shared iPads and Classroom App allows for students to use an iPad between each other, and for teachers to monitor and control what they’re doing on that iPad. It’s Apple finally acknowledging the affordability problem, as well as creating new and better ways to communicate between devices e.g. students sharing their work with Apple TV via AirPlay without an internet connection. A particularly favourite feature is “intelligent caching”, which doesn’t require the student to have anything downloaded every time they log in with their profile. It sounds independent of cloud technology, or at least largely - perhaps a necessary step back for enabling reliability. While it may push schools to purchasing devices with greater capacities, it certainly beats buying at a 1:1 student-to-iPad ratio. There’s Apple School Manager, what looks to be an intranet for easy management of devices on a school-wide scale. At first glance at their marketing material, it looks simple and straightforward. The Setup Assistant displays categories of people that make up a typical school intranet and you can add them just by clicking a + button - at least that’s what it looks to me. I’m no expert, but it’d surprise me if there was any other way to do it that was great. Too bad there doesn’t seem to be a native app for Mac, unlike what they’re doing with iPad. Lastly, there’s Managed Apple ID’s, which are like Apple ID’s but “designed just for schools so you can easily reset passwords, audit accounts, create IDs in bulk.” I think it’s brilliant to introduce the existing Apple ID framework - something that’s already widely understood - and create a management tool around it. Everything about the Education Preview sounds so centralised and full-featured. It’s also holistically designed - each feature is tailored not just within context of the other features in the Preview, but other things that Apple’s made like iTunes U and Apple ID, which is what they’re historically great at. Schools that have adopted iPads already should also find it relatively easy to integrate these new tools, at least those that already use Apple ID’s for students. Nothing about this sounds half-baked to me. While it’s yet to be put to the test, it excites me that Apple has made seemingly leapfrog steps to compete in the education market dominated by Google. This is just a few among other new features in 9.3. Click the link below to see the full preview.